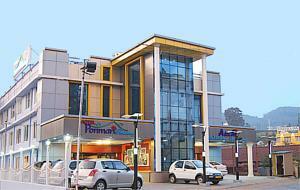 Ponmari Residency is located in the heart of Ooty Town, a 10-minute drive from the scenic Botanical Gardens. The hotel has 24-hour room service and a 24-hour front desk. Free Wi-Fi is available at the hotel's lobby. The spacious rooms are all equipped with a flat-screen TV and sofa. Private bathrooms come with 24-hour hot/cold water showers. Room heating is available at an extra charge. Ponmari Residency is 2 km from Boat House Lake and 90 km from Coimbatore Airport. Free parking is available. There is also a rest room for guests' personal drivers. Guests can arrange day trips at the tour desk. There are also meeting room facilities and a doctor on-call. Ponmari Restaurant South Indian, Chinese and Continental cuisines. Other dining options include chocolate shop and a bar.